I don’t generally make a lot of pasta-based dishes these days, but this recipe from Food & Wine magazine caught my eye. They look a bit complicated to make, but they’re actually very quick and easy to make. 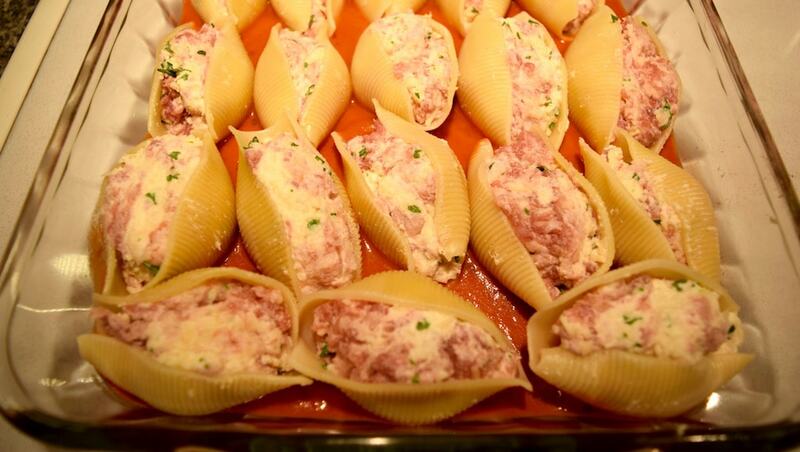 The longest part of making them is actually spooning the filling into the shells. Filled shells ready for the marinara topping. 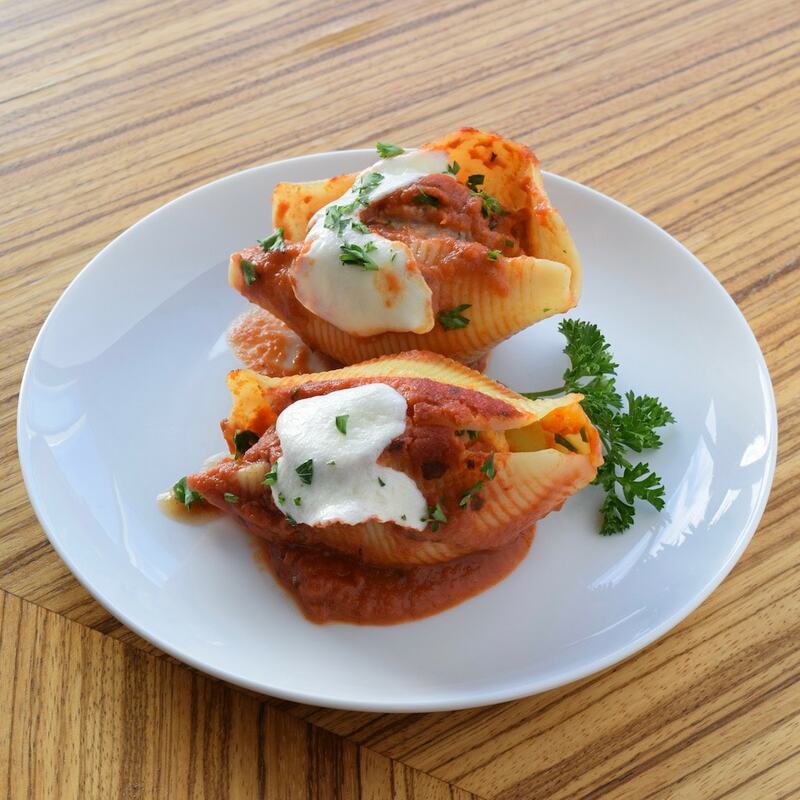 In a way, these are just a different format of lasagna, which is a good thing. I’d actually rather have these than lasagna. The thing is, though, using just ground pork for this recipe seems like a missed flavor opportunity. Using a spicy Italian sausage seems like a more likely candidate for this dish. Also, don’t be afraid to mix in a little more ricotta cheese into the meat mixture. I felt that the original recipe called for too little. Begin heating your oven to 375 degrees. Boil water in a large pot and cook the shells for about 9 minutes—al dente. Drain when done and set aside somewhere where they won’t be stuck together. While the pasta is boiling, in a large bowl combine the pork (sausage), ricotta, panko, garlic, beaten egg, Parmigianino and a half-cup of parsley, ¼-cup cream, 2t salt (seems like a lot) and 1t pepper, and mix them well. I use nitrile gloves to mix by hand. Next, in another large bowl, mix all of the marinara sauce with the remaining ¼-cup of cream. Add half the sauce to the bottom of a 9-by-13-inch baking dish. Funny note here: that wasn’t a big enough dish for all of the shells. I had to put about 8 remaining shells in another baking dish. This was not a major problem, but keep it in mind. Now stuff each shell with a heaping tablespoon of the meat mixture and close the shell around it. Then nestle the shell, split-side up, into the marinara sauce. Repeat until all the shells are filled. Spoon the remaining sauce over the shells in the dish. Bake covered for 45 minutes. 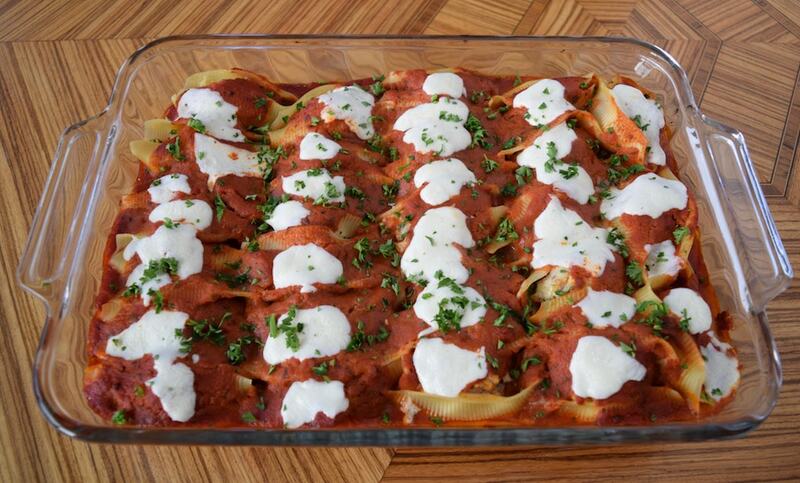 Uncover, add the fresh mozzarella over the shells, and bake for 15 more minutes. Let them sit for about 10 minutes before sprinkling the remaining parsley on them and serving. The recipe serves from 4 to 8 people.